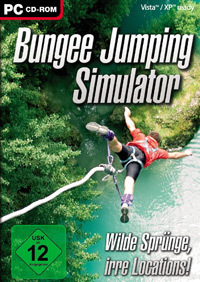 Bungee Jumping Simulator is a UIG Entertainment-produced arcade game with simulation elements that allows players to experience the excitement of rope jumping. The creators have prepared many spectacular sceneries, where you can try your hand as an extreme jumper. "This is the motto chosen by UIG Entertainment developers when preparing the game Bungee Jumping Simulator. The title is supposed to bring the players closer to the arcana of extreme line jumps. However, the creators decided to combine simulation and dexterity elements, enriching the game with a system of points for the spectacularity of jumps and acrobatics. In the bungee Jumping Simulator the player directs the actions of the jumper, standing at the threshold of great fame in this extreme sport. Initial jumps are made from small heights and quite standard structures (bridges, dams, etc.). Along with his experience, the hero can develop a set of skills, increasing the ceiling, point bonuses and visiting more and more interesting locations (e.g. skyscrapers' roofs). Over time, it is even possible to select the parameters of the equipment, including the length and type of rope. The creators of the bungee Jumping Simulator have prepared three levels of difficulty, allowing the fun to be adjusted to the player's skills and expectations. Each leap is evaluated taking into account a number of factors. Based on the accumulated points, online rankings of the best ski jumpers of the day, week, month and all time are created. Technically, the bungee jumping simulator is below average. Three-dimensional visual setting of the game stands out from modern standards. The action can be tracked from several camera shots. Noteworthy are the relatively realistic physics of the flight and varied animations of the jumper's movement. Game score 3.5 / 10 calculated out of 46 players' votes.